The Wild Atlantic Way is a world-famous coastal route that spans the west coast of Ireland and takes in some breathtaking scenery along the way. It spans from Donegal to Galway and Kerry to Cork in the south. Doolin Cave is home to a wondrous geological phenomenon - The Great Stalactite. Measuring almost 7 metres in length, it is one of the largest free hanging stalactites in the world. This is a truly wondrous sight. In order to preserve the delicate ecosystem of the cave numbers are limited per tour and per year. The cave tour takes approximately one hour. Access to the cave is via a courtesy coach from Bruach na hAille Restaurant in the village of Doolin just 3 miles from the cliffs. Ferry boats travel daily (weather permitting) from Doolin to the Aran Islands, just off the coast of north Clare. The Aran Islands are part of County Galway. However the smallest island, Inis Oirr, is only six miles from from Doolin, which is the closest mainland point to the islands. The islands are one of Ireland's Gaeltacht areas, which means the people living there speak Irish as their first language, however nearly all of the inhabitants speak both Irish and English. The word "Burren" comes from an Irish word "Boíreann" meaning a rocky place. This is an extremely appropriate name when you consider the lack of soil cover and the extent of exposed Limestone Pavement. However it has been referred to in the past as "Fertile rock" due to the mixture of nutrient rich herb and floral species. 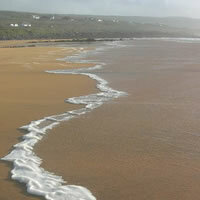 Tony Kirby offers a variety of guided walks in the burren. 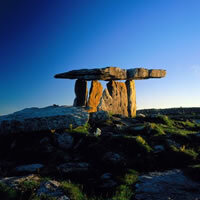 The walks feature a wealth of information on the geology, flora, archaeology, fauna, farming and folklore of the Burren. The Poulnabrone Dolmen one of the most well-known megalithic tombs in Ireland and dates back to about 2500 BC. The Dolmen is located about eight kilometres south of Ballyvaughan and thirty kilometres east of Doolin. It consists of a rock of limestone of 3,65 metres in length which is supported by two other upright rocks. A crack was discovered in 1985 and then in in 1986 restoration and excavation work was carried out. During this work, it was discovered that somewhere between 16 and 22 adults and about 6 children were buried under the dolmen. The Cliffs of Moher are Ireland’s most visited natural attraction which attract up to one million visitors every year. The cliffs stand 214m (702 feet) at their highest point and stretch for 8 kilometres (5 miles) along the Atlantic coast of County Clare in the west of Ireland. On a clear day you can see the Aran Islands and Galway Bay from the Cliffs of Moher. O’'Brien’s Tower stands near the highest point and has served as a viewing point for visitors for hundreds of years. You can also view the cliffs by taking a boat trip from Doolin. For walking and hiking enthusiasts, The Doolin Cliff Walk, which runs from Doolin village to the Cliffs, provides breathtaking views of the Atlantic on one side and green fields and cattle grazing on the other. The route takes about three hours to walk. You can also opt to take a guided walking tour with local farmer and historian & walking enthusiast Pat Sweeney. For a longer walk, there is also a coastal cliff walk from Liscannor to Doolin. Historically a fishing village, Doolin is now also acclaimed worldwide as the traditional music capital of Ireland. The three pubs in Doolin that have live music are McDermott's, O'Connor's and McGann's. Visitors will find music performed nightly by both local and visiting musicians which makes each night unique due to the eclectic styles and mix of instruments. Copyright © 2019 doolancoastalcottages.com. All rights reserved.